Faster automated patch clamping without a microscope. This system is similar to the ChannelMAX 100A Mini except it can be used for doing two two-electrode voltage clamp experiments or up to four patch clamp experiments simultaneously. With two additional micromanipulators, the system can do dual two-electrode voltage clamp (TEVC) experiments silumtaneously. Designed to be affordable to the scientific community, this system increases productivity significantly. Additional units can be run in parallel to further increase TEVC throughput. As each manipulator can do one patch clamp experiment, the ChannelMAX 100A Twin can run up to four patch clamp experiments at the same time. This system significantly increases productivity for patch clamp. Since the computer controlled manipulators guide the patch pipettes to touch the cell membrane in a more precise and consistent manner than manually controlled manipulators, the success rate of making seals is over 90%. The system possesses the same high quality, noise free, low drift and vibration free data acquisition as the PatchMAX 100A system. This system is more cost effective than a traditional electrophysiology setup. In order to reach the same functionality and productivity using a traditional setup, the equipment cost is more expensive, as compared in the table below. Plus labor cost is additional. Coming with the lower cost is also better quality. The user has control of each automated manipulator using software, so that it can act like a manual manipulator. Each manipulator can be removed and repositioned easily on the breadboard. 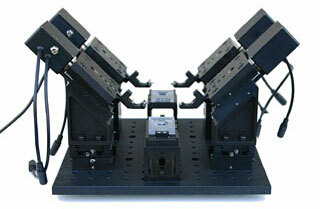 The manual stages that come with the manipulator allow fine adjustment of the postion. The system can be used with variable lengths of pipettes. With a footprint of only 12 in x 12 in, the ChannelMAX 100A Twin combines multiple TEVC and patch clamp systems into one. This significantly reduces the lab space requirement. ChannelMAX 100A systems relieve users from labor intensive experiments through automation. This configuration doubles the efficiency compared to the ChannelMAX 100A Mini, thus providing the best value. If you work on 50 oocytes per week using a traditional two-electrode voltage clamp system, now you can extract data from 100 oocytes per week.